Glass Magazine is inviting submissions for the 2018 Glass Magazine Awards program. To make sure your company is included in this prestigious awards program, please submit your nomination using the appropriate form below. The deadline for nominations is May 31, 2018. Glass Magazine is also accepting submissions for the 2018 Reader Photo Contest. Read more about the program, and submit photography here. The awards are split into two overall categories: Project Awards and Product Awards. Please read the individual category descriptions below, then fill out the appropriate submission form. Submission forms are located via the following links or at the bottom of this page. Editors reserve the right to reallocate submissions to different categories as appropriate. Companies are limited to two nominations total. Please do not submit the same nomination for inclusion in multiple categories. By submitting images to the Glass Magazine Awards, you agree that you/your company are the originator or copyright owner of the work, and that you grant Glass Magazine and its parent, the National Glass Association, permission to use your submitted work in publications and related materials. To qualify for most innovative project categories, projects must have been completed between January 2017 and May 2018. These two categories highlight innovative glass curtain wall façades. All types of glass curtain wall systems (including structurally glazed façades), and all types of framing materials, are eligible. Curtain wall projects will be judged on performance and aesthetic attributes, and on the distinctive elements of the glass and glazing systems that set a project apart from traditional curtain wall jobs. This category highlights innovative monumental glass entrances on the building exterior. All types of glass systems are eligible. Monumental entrance projects will be judged on performance and aesthetic attributes, and on the distinctive elements of the glass and glazing systems that set a project apart from traditional entrances. This category highlights interior and exterior decorative glass projects. All styles of architectural decorative glass are acceptable. Projects will be judged on performance and aesthetic attributes, and on the distinctive elements of an installation that set the project apart. This category highlights interior and exterior projects that feature glass as a walking surface. Projects will be judged on performance and aesthetic attributes, and on the distinctive elements of an installation that set the project apart. This category highlights interior glass, from glass railings, wall systems, partitions and doors. Projects will be judged on performance and aesthetic attributes, and on the distinctive elements of an installation that set the project apart. To qualify for most innovative product categories, products must have been released between January 2017 and May 2018. This category highlights new machinery or equipment for glass fabrication, metal fabrication, system assembly, product transportation or product handling. Machinery and equipment for factory or field uses are eligible. Submissions should describe the need that the machinery or equipment satisfies for the customer, and should demonstrate the distinctive elements that set it apart from similar machinery or equipment on the market. This category highlights new web tools, apps or software products. Eligible products include those targeting users in the glass and glazing industry, or those intended for members of the design community. Submissions should describe the need that the tool, app or software satisfies for the user, and should demonstrate the distinctive elements that set it apart from similar products on the market. This category recognizes new and innovative glass and glass components products (glasses, coatings, spacers, etc.). Submissions should describe why the product benefits the customer, how it serves and improves the industry, and what sets it apart from the competition. Submissions will be judged on a product’s ability to advance the industry and meet customer demands. This category recognizes new and innovative industry metal products (framing, systems, hardware, related components). Submissions should describe why the product benefits the customer, how it serves and improves the industry, and what sets it apart from the competition. Submissions will be judged on a product’s ability to advance the industry and meet customer demands. 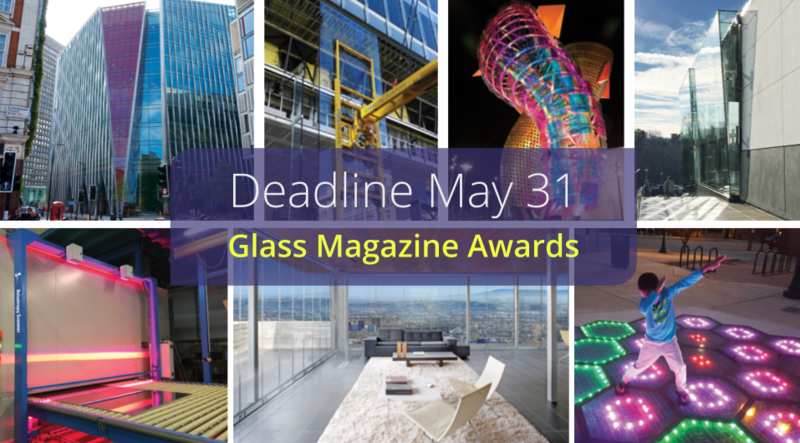 To nominate a product or project for the 2018 Glass Magazine Awards, complete the nomination form by May 31.